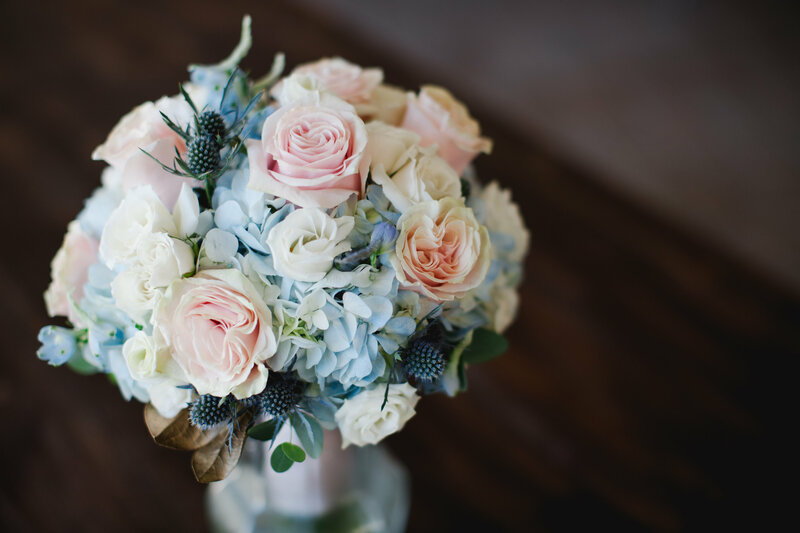 If you have been invited to a wedding in the past couple of years, chances are you have seen the hydrangea flower in either the wedding centerpieces or even in bridal bouquets. If you are big on the meaning of flowers, hydrangea means love and admiration, making it a sought after flower by brides to-be. Hydrangea was first cultivated in Japan, but they have recently found fossilized hydrangea in North America dating back millions of years. Hydrangea was not seen in Europe until the 18th century when a colonist brought the North American hydrangea plant over to England. Today, hydrangea mainly grows in the Americas. Big hydrangea heads are many smaller blooms clustered together. The little star-shaped flowers grow along wooden stems and create a big, pompom shape, making them very versatile and very easy to use in arrangements. The most common color of hydrangea is white, but they also come in a variety of colors; such as blue, red, pink, or purple. In hydrangea varieties, the exact color often depends upon the acidity or alkalinity of the soil. Acidic soils produce blue flowers, neutral soils produce pale cream petals, and alkaline soils result in pink or purple. They can also change color, or be bi-colored. All depending on how acidity is added or removed from the soil. Hydrangea is available all year round, making it great for any occasion you would like to celebrate! Some brides often worry that if they choose hydrangea for their wedding flowers it will wilt easily. If your florist sources the hydrangea from top quality sources and hydrates each bloom properly, you will have nothing to worry about. They are a beautiful flower that will compliment any wedding arrangement. Take a look at a past wedding we created which included hydrangea in the wedding bouquets and wedding centerpieces.